Something no business can ignore is SEO or search engine optimization. SEO could be incorporated into a strong marketing strategy to support both online and offline marketing efforts. The challenge with SEO is that it’s constantly changing, sometimes those changes have a huge impact on the way you operate. Google could drop a new algorithm update at any time and it can send even the top-performing websites into a downward spiral of confusion. It can feel a bit like trying to fix a house after a hurricane. On top of this, everyone seems to have a slightly different understanding of what they need to do to increase optimization and what they shouldn’t be doing. SEO can be broken down into two main parts. The first part is ‘on-page SEO’ and the second part (you guessed it) is off-page SEO. You need to do both of these well, to stand any chance of ranking. Some SEO beliefs are just so outdated that now they are merely a myth. Other things you once considered not that important, are having the biggest impact on your rankings. What’s the latest in on-page SEO for 2019? Where does it stand today? On-Page SEO is all about how your website is built, from user-experience down to how search engines find and locate your web pages. Search engines use bots to crawl your website. If your website isn’t allowing this to happen, Google can’t crawl it correctly. This gets a little bit techy, so ask your web developer to handle this part. The most important thing to remember is that bots don’t have eyes. You will first need to identify the keywords that you want to rank well for and then design keyword rich text for your pages. When it comes to keywords, just write it first for user-experience. A keyword rich page still needs to read well and ‘stuffing’ to try and please Google will just result in penalties. Do you have clear call-to-action across your website for customers? Is your content accessible? Does it meet the web content accessibility guidelines? Is the mobile version of your website fully responsive? Does the mobile version work just as well if not better than the desktop version? Google index mobile-first and have done so since 2018. The page load speed of your mobile website should, therefore, be top notch. Is your website secured with an SSL certificate? Do you offer a range of content types on your website? Video, images, and text. Is your content sharable? Add social sharing buttons to make this easier. Is your content really good? If it’s just ‘average’ this is where you’re going wrong. Make your website the most valuable source of information in your niche. Title tags and meta descriptions are still important. It’s the first thing someone will see on Google. Ultimately you need to think about what a user is searching and what answer they are actually looking for. How can you answer their search query in the simplest way? This doesn’t always mean having visitors land straight on a sales page. You might offer advice, tips and other support on your website which are equally valuable when it comes to ranking content. We’re in a digital age. So much so that the digital world rules our day; from the minute we are called to life by our smartphone alarms, to the minute we close our eyes and a background app is monitoring our sleep! When you really stop and think about just how integrated technology is in our daily lives… it’s terrifying! Yet it’s also completely normal and accepted. As business owners and marketers, the digital space gives us so much opportunity that we just didn’t have 10 years ago. It gives us access to people in a completely new way and with that comes immense amounts of valuable data. The problem is, that businesses are so focused on the next big digital move that they often neglect more traditional methods of marketing that are still, if not more, valuable today. Direct mail marketing cuts through the digital noise and stands out in a world of screens. Yes, offline mail could well direct the customer to a website or online platform, but it does so in a more authentic way. Once upon a time, online shopping was a risky business. People didn’t know what or who was authentic online and which businesses they could trust. Today we know that online shopping and online communications are safe and we know what to look for as consumers. The thing is, there is so much spam online and that many advertisements, emails, and websites that it’s difficult to build trust when you’re trying to reach brand new customers. Recently there have also been huge issues with social media exploiting user data, again eroding online trust. As a result, trust is actually on the decline, unless you’re a huge brand with a huge reputation. Even creating a positive brand awareness can be a challenge. This is where direct mail could really help you out. 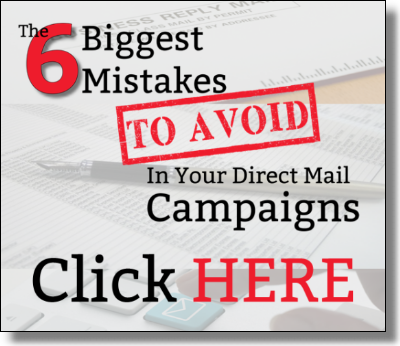 “76% of the consumers trust direct mail when it comes to purchasing decisions,” but why is this? Well, the answer is quite simple, people trust direct mail because they are receiving something tangible and real. It’s usually highly targeted for local businesses and it’s often much more personal. If we need to reach a dentist in New Jersey who purchased a Ford in the last six months, we can find that list. This is not so much the case with online. Even with all that data, we still can’t target users at that level of detail. Another thing to consider is the potential for mail to hang around a while, as a reminder. Customers might keep a flyer on their counter side, on a table top or in a pile of papers to look at later. Online, when a browser, website or email is closed, so is that advertisement… until it maybe appears again, if and when it does. We know what you’re thinking… how can something be lighter on the brain and how can we know that? Well, a fantastic Canadian neuromarketing firm carried out a study which showed that it takes 21% less cognitive effort to process direct mail compared to digital media! They concluded that direct mail was easier to digest and easier to remember. Online tools such as email are very good at building rapport once you have a relationship. However, because of the spam effect, they are not very effective when prospecting for new customers. In addition, search engine marketing works well when customers are looking for a product or service. However, when we want to reach out to them with a new offer, especially something they might not have otherwise considered (or didn’t even know they needed), direct mail is better at getting the job done. Of course, we’re not saying that online advertising isn’t valuable. It 100% is a crucial part of any marketing strategy in 2019. We’re just asking you to consider older forms of marketing that still carry a lot of trust for the majority of consumers. When you’ve reflected on your business performance from the previous year, done the math and looked for patterns in your finances, you’re ready to focus on new opportunities for growth. These are the simplest steps to successful strategic planning and we’re going to share a very easy tool that can help you with this area. 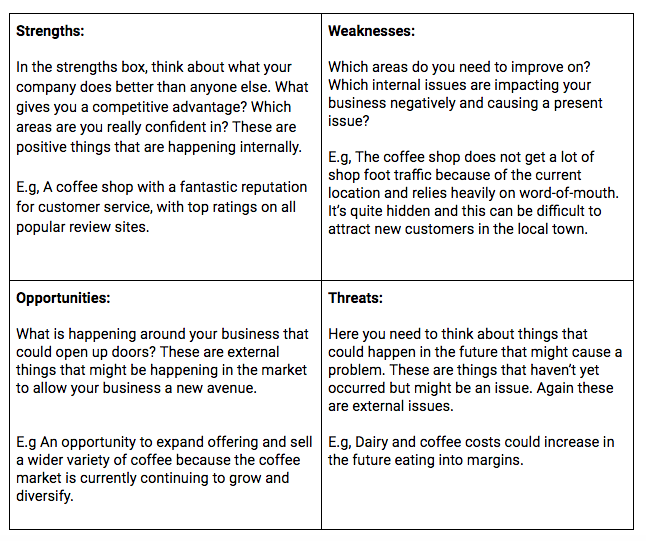 A SWOT analysis sounds like something you learn in business school…. And it is! However, it’s one of the simplest and earliest things you learn, so don’t be scared off by the fancy name. SWOT stands for ‘Strengths’ ‘Weaknesses’, ‘Opportunities’ and ‘Threats’. The SWOT analysis simply asks you to think about each of those things. You can do this to look at your business overall, or you can carry out a SWOT analysis for a specific project idea to assess the pros and cons of that potential venture. Below we have inserted some examples based on an independent coffee shop business. In the strengths box, think about what your company does better than anyone else. What gives you a competitive advantage? Which areas are you really confident in? These are positive things that are happening internally. E.g, A coffee shop with a fantastic reputation for customer service, with top ratings on all popular review sites. Which areas do you need to improve on? Which internal issues are impacting your business negatively and causing a present issue? E.g, The coffee shop does not get a lot of shop foot traffic because of the current location and relies heavily on word-of-mouth. It’s quite hidden and this can be difficult to attract new customers in the local town. What is happening around your business that could open up doors? These are external things that might be happening in the market to allow your business a new avenue. E.g An opportunity to expand offering and sell a wider variety of coffee because the coffee market is currently continuing to grow and diversify. Here you need to think about things that could happen in the future that might cause a problem. These are things that haven’t yet occurred but might be an issue. Again these are external issues. E.g, Dairy and coffee costs could increase in the future eating into margins. At surface value, the SWOT analysis doesn’t help you prioritize these things, but we shouldn’t stop here. It’s crucial to prioritize the top 3-4 items within each quadrant. Rank your strengths and weaknesses in terms of importance. You will need to give this some thought, but by ranking them the SWOT gives you a clearer picture of what’s going on. Keep in mind that there are limitations of the SWOT analysis. It can’t be used for in-depth issues and it doesn’t help you prioritize things. It’s great for identifying problems but it doesn’t offer any solutions. The model doesn’t assist you with thinking about ways to overcome weaknesses or protect your business against threats. It’s purely just a starting place and although it seems simple, it forces you to focus on each area and then look at the bigger picture taking in to account each quarter. What does 2019 have in store for us and how can we align our marketing strategies in preparation? When we hit the new year it’s almost like a reset button has been pressed and we’re ready to embrace change, dive into new projects or re-focus on areas of the business we’ve previously neglected. We hope this list gets those ideas flowing and helps combine your marketing efforts into something successful. Building and maintaining trust with a customer is crucial. Without trust and belief in your business, a sale will not happen. Direct mail is a valued method of communication because typically, customers view it as more authentic than other forms of communication. In fact, many businesses that turned their back on ‘old school’ methods of marketing are finding it’s crucial to return to more traditional methods in a very digital world. To increase credibility when sending mail, consider adding information about your team; a friendly face of the CEO or team photo where possible. This is particularly important if you are introducing your services/products to a customer for the first time. Genuine testimonials can also help to add credibility. Video just cannot be ignored. It is one of the most powerful forms of online marketing. It boosts interaction, maintains engagement for longer and in most cases, increases conversions. By 2020 it’s predicted that video will be 85% of all consumer traffic within the US. So, how can you utilize video effectively? Explainer Videos: Use these on-site to explain your service or product in a short video clip. An explainer video works well for more complex offerings. Customer Testimonial Videos: If you’ve got the time and the resources, creating a case study video, or just compiling lots of testimonials into a video is one way to add credibility. Micro-Video: Short clips that are usually around 15 seconds long. Instagram story videos are the perfect example of this. You can use these micro-videos to grab attention very quickly and pull social media users into your offer. You can also use micro-videos effectively within paid social media advertising to do the same thing. If you have some powerful video content to share with customers, you can use other forms of marketing just as direct mail to drive traffic to that video. Utilise an omnichannel direct response strategy, making the most of different traffic driving methods such as email, direct mail and social media. We’re talking smart speakers like Amazon’s Alexa home speaker or Apple Homepod. These voice-assisted devices are set to completely change the future of marketing as consumers say they will never go back! We predict large companies like Amazon will start selling ad space connected to their smart speaker devices. We should also start to see a shift whereby more audio content is published online, in a bid to be accessed by smart home devices. We’ve mentioned that direct mail is a great source of trust, but we’ve also explained just how valuable video marketing is and other forms of online marketing. So what’s the best approach overall? The truth is you need to take an integrated marketing approach in 2019 and utilize both online and offline methods to get the most out of your campaigns. The other thing to point out is that direct mail gets attention. Prospective customers may get 100’s of email messages a day so SPAM is a persistent problem. People hit delete without even reading the message. You have a lot less competition for attention in a mailbox. It requires a physical action to get the mail and it’s much easier to break through the clutter. You have a lot less competition for the customer’s attention in the mailbox. It requires a physical action to get the mail. It is much easier to break through the clutter. Align your campaigns so that they support each other. Include social media icons or hashtag references on offline material where relevant. Collect online data from customers who entered your funnel at an offline point. The more you can integrate all areas of your marketing, the more you will get out of it. Finally, don’t forget to maintain the same branding throughout to ensure smoother integration.